I left the guesthouse about 8am with the usual crowd of people watching me leave, though no questions which was unusual. I stopped along the way around the big lake and took some photo's. Riding through another storm I made my way back to the normal weather patterns of Ulan Ude. After some breakfast of borsch, the famous Russian soup that I now seem to live on and coffee I pointed the DR south for the first time. I have grown to hate not moving west this trip, every time the road turns north a little it fells like wasted time, wasted time that moves me ever closer to the eminent cold weather, I keep picturing myself knee deep in snow somewhere in Finland. But this time it was a little different, I was making for Mongolia. Arriving at the boarder about 4pm I had something to eat, stocked up on food and came to the relisation that I knew nothing about Mongolia, nor what to expect at customs. Although I thought arriving late in day on a Friday may have advantages I really did not know. Once exiting the Russian side I found myself sitting down in front of a large xray machine (that wasn't working) filling out my own Carnet De Passage with some very polite Mongolian's. I showed them where to stamp the Carnet (a form that act's as a type of passport for your motorbike) even though it is only used for certain country's and Mongolia is not one of them. But, once seeing that I had a Carnet custom's insisted that they needed to fill it out, though they did not know how. Between the six of us (yep 6) we filled out the Carnet and stamped everything in triplicate. I asked if I could take the pile of cigerettes and beer that they must have confiscated from some Russians at some stage that day. There response was much laughter and I was offered instead one of the customs girls to be my pillion and Mongolian guide. I had to refuse there kind offer and after two hours of the most relaxed border crossing I think I'll ever experience I was in Mongolia! I rode another 20km or so to the next big village where some more friendly custom's official's waved me down and said they would find me somewhere to stay where I could lock up the bike. 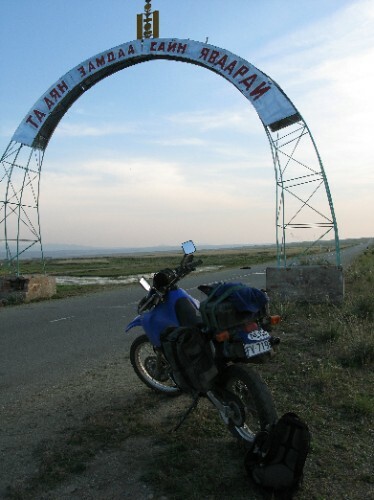 After a couple of phone calls and a short drive we arrived at a hotel where I locked up the bike in their garage, paid the landlady $A25.00 for the night and bid my customs friends goodbye with a lot of hand shaking and a "Welcome to Mongolia!". Welcome indeed!